Chief Minister Sh Jairam Thakur with a high powered team of ADB at New Delhi. 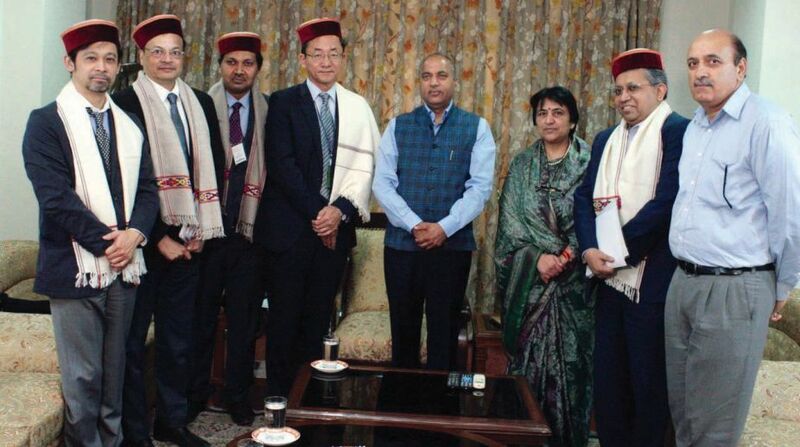 A high powered team of Asian Development Bank (ADB) led by Country Director Kenichi Yokoyama met Himachal Pradesh Chief Minister Jai Ram Thakur at New Delhi on Thursday. The team held discussions for Rs 750 crore second trench proposal under Infrastructure Development Investment Programme for Tourism for ADB funding. An official release said that the ADB team appreciated the efforts of the Tourism Department in implementing the phase one and phase two projects under the programme which shall be completed in 2020. The CM said that 19 projects were sanctioned under phase one out of which 16 had been completed, whereas, three will be completed by June 2020. Main projects under these include beautification of Shimla, restoration of Town Hall, parking at Tutikandi (Shimla) for 1,000 cars, parking and tourist integrated centre at Chintpurni. Work on 12 projects under phase two is in progress and will be completed by 2020. Thakur further said that efforts were afoot to send a new proposal worth Rs 1,800 crore for ADB funding to promote tourism with an objective of safe, sustainable, economic, eco-friendly tourism habitat supported by improved infrastructure and services. He said that discussions were held on Thursday for the first phase of the proposed project worth Rs 750 crore. He said that the team showed an encouraging attitude. Earlier Additional Chief Secretary Tourism Manisha Nanda held preliminary meetings with the team in February and requested them to visit Shimla and forwarded a concept plan and preliminary project report for positive response from the ADB team. Manisha Nanda informed that a tentative list of proposed works under the project has been prepared and discussed for developing various tourist places in the state and strengthening infrastructural facilities in these locations.